Los Angeles Historic-Cultural Monument No. 223, built for businessman Zachariah Weller in 1894. 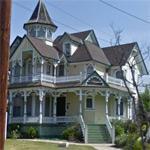 Moved to its current site in Angelino Heights in the early 1900s. Businessman Zachariah Weller’s house was just six years old in 1900 when he sent his family off for a short vacation on Catalina Island, split the house in two, and moved it about 3,000 feet north (as the crow flies), deep into Angeleno Heights. When the Weller clan’s Avalon holiday was up, they returned to a home not only no longer encroached upon by filthy oil wells, but one which was newly wired for electricity, the first home in the Heights to be powered as such.